Yes, I love this sort of smocking. In fact, I couldn't get enough of it when the Princess was a baby. But that's not what I'm talking about. How amazing are these curtains? I first saw a set of these lovelies at my sister-in-law's home a few weeks ago. She redid her girls' room and used some of these on the windows. I. fell. in. love. (I promise to do a post on that room one of these days....AMAZING!) But I digress. I decided that I need some of these for the Princess' new room. Their price tag, however, was a little too rich for my blood (and if her husband reads this...I'm sure she got them on sale). Just wait 'til you see my solution. I make you all wait to see things a lot, don't I? Sorry about that. Really. Anthro's Crowned Crane bedding. Simply amazing. I wanted to crawl right up on the display bed and take a snooze, but I thought the sales girl might not appreciate having to babysit my boys. I'll tell you what though, I may just have to start a new duvet cover fund. It was that good. What about you, my dear readers? Do you like smocking? 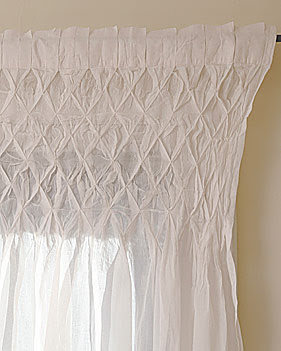 EDITED TO ADD: I have had a couple of readers tell me about PB's smocked drapes. Hello?? With as much as I look at the Pottery Barn catalog and website, how did I miss these? Seriously. I made a baby's dress at school and although I disliked our needlework teacher (and therefore, lessons), I did find it quite satisfying doing the smocking. I never heard of smocking! You have introduced me to something new! OH, the curtains and bedding are both dreamy. I squeeled when I saw those curtains! I nearly caused a tsunami grabbing a pair of closeout PB drapes like that a few years ago that are proudly hung in my bedroom. I sigh and gaze at them lovingly each time I walk by. I just noticed the smocked drapes in the new PB catalog last night! They are perfect!! I'm trying to dream up a spot for them as we 'speak'! They also have a great ruched duvet cover -it's lovely! It would just never work in my old farm house though! :( Love ya! good luck with your Anthro shopping, wish I could come with you. I too love smocking, it's just so pretty! Thanks Simple Sage..... 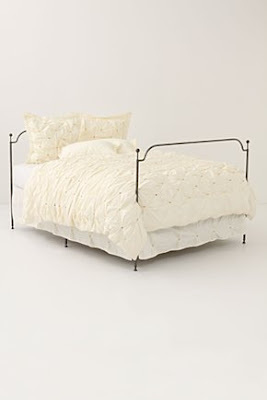 I just went to West Elm and love their duvet, not a bad price considering it's organic. I just might have to get that for my new room. I have been swooning over that same Anthro duvet too. I also like Anthro's cirrus duvet and West Elm's pin-tuck duvet. Anyone know how we could make our own? Tutorials...anyone? Love the drapes. I'm stuck on drapes for my oldest daughter's room... so far all the curtain's i've picked out are on backorder...ugh! I adore smocking in a shapes and forms! My aunt actually had a smocking company. It's almost a lost art. I love smocking! These curtains are fabulous! YES! That is my new favorite thing...bedspreads, curtains, pillows. This is so exciting. I never knew what this (smocking) was called before and I have been trying to describe it to my mom in law. My wedding dress has been sitting in my closet for six years now and I didn't know what to do with it. I decided I want to make it into a quilt and I wanted it in a certain style but didn't know how to explain the style I wanted. This is exactly what I was looking for. Thank you so much for this post! I had the same exact fit last year when I saw that bedding- then lo and behold, I found a VERY SIMILAR comforter set at Target for under 100$. Check and see. Smocking is a great detail that I've loved for many years. My grandma used to make me little smocked dresses and she made wonderful throw pillows with smocking detail. Thanks for helping make smocking fashionable again!